In an exclusive interview with Twitter CEO Jack Dorsey on Wednesday, NBC Nightly News anchor Lester Holt wanted to know how the company went about suspending the account of internet conspiracy theorist Alex Jones. 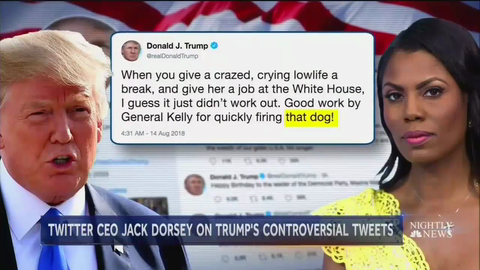 And using that as a springboard, Holt wanted to know if President Trump violated the rules, like Jones did, with his “dog” tweet about former White House staffer Omarosa Manigault Newman. “Do you make exceptions for high-profile individuals in terms of your rules of service,” Holt asked Dorsey during their sit-down. After the Twitter boss said they hold all accounts to the same standard, Holt jumped right to Trump’s. “The President of the United States yesterday, called a woman -- Omarosa ‘that dog.’ Would that violate your terms of service,” he pressed. So we do have a clause within our terms of service around public interest and around newsworthiness. We believe it's important for the world to hear directly from global leaders how they think and how they treat the people around them. (…) We make an understanding of who is actually saying that and whether they are a global leader, whether they are a public figure and whether this is something that should be reported on and should be talked about.